Some of you might already know, the cuisines of India are similar to Indonesian cuisines. The key is the using of various spices to make the food flavorful and to give the natural color to the food. So it sure looks exotic in your eyes and scrumptious in your taste buds. Even though I have never eaten Indian food but some of Indonesian foods are close enough to Indian foods. We have kari and roti cane which I believe those were derived from Indian cuisine. After long time of waiting, I finally can feature a special guest post on my blog written by Soma Rathore of eCurry. Never thought she would say "yes" when I asked her to write a guest post for me. She has tons of delicious recipes with beautiful photos. No wonder she has won DMBLGiT for several times, because her blog looks good ! Soma, my dear cyber world friend and a sweet nice lady, has done a wonderful job for me through this post. She cooked a famous dish from West Bengal. 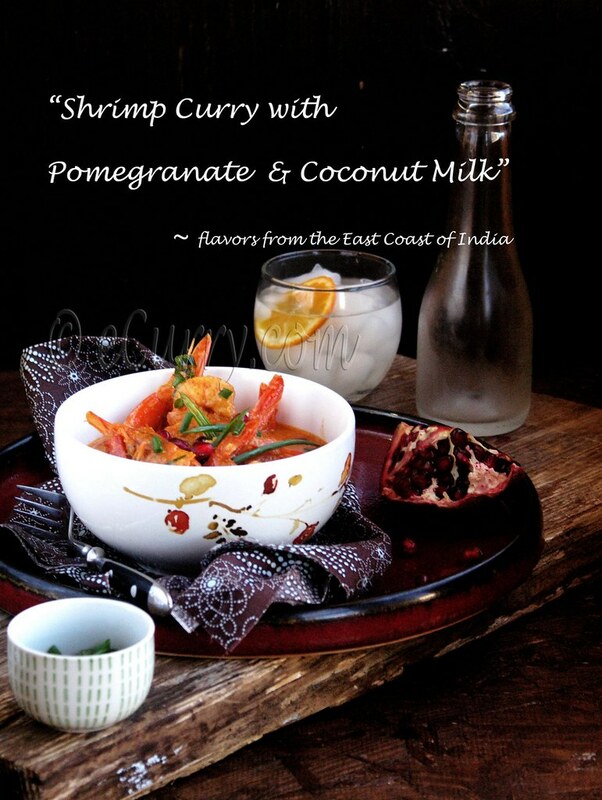 Let's give her a big welcome with her homemade and traditional cuisine from India which also the first Indian food recipe on my blog, Shrimp Curry with Pomegranate and Coconut Milk. Reminder : The giveaway event is still open and you still have few more days to join in. Please read here for details. 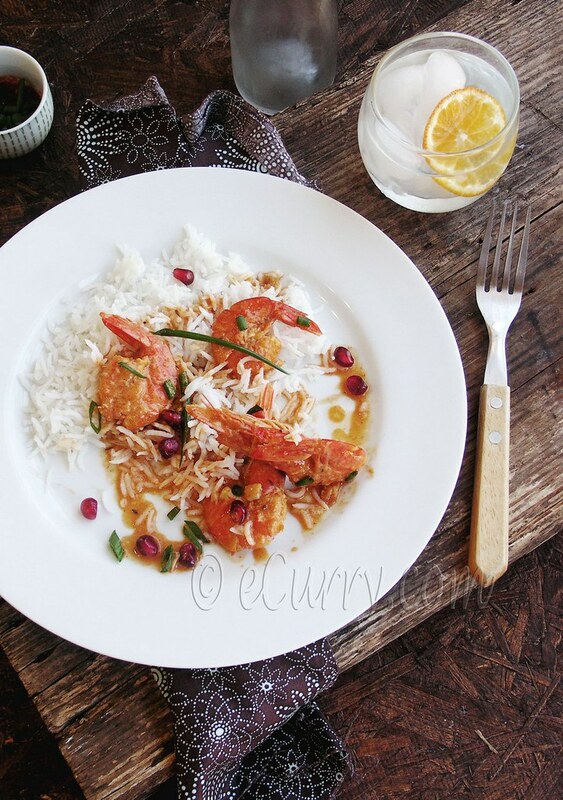 These delightful shrimp curry carries the flavors from my home. Cooked in creamy coconut milk, it is redolent of cardamom and cinnamon – spicy but with a hint of sweet. And to this packet with memories, I have also added some pomegranate, a twist which worked out really well. 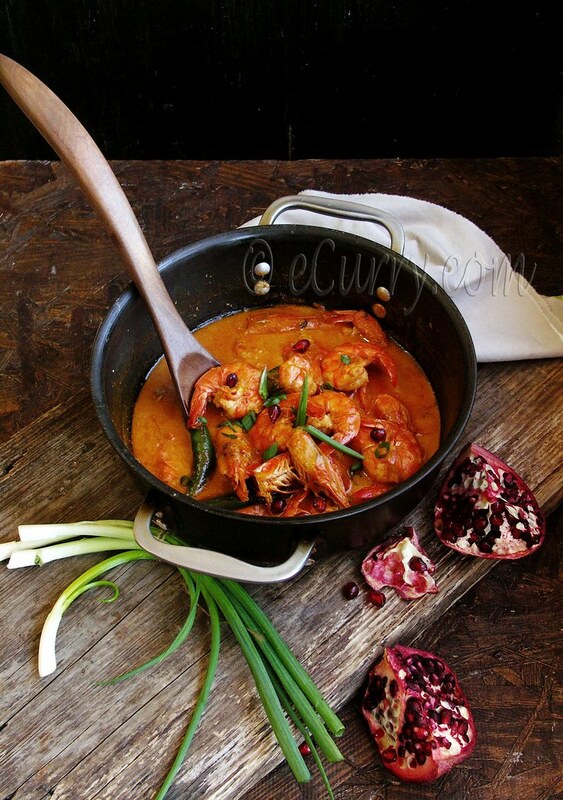 When Tika of Cemplang Cemplung asked me if I could write a post with a traditional recipe for her, I could think of nothing but my love for this particular shrimp curry cooked in coconut milk. 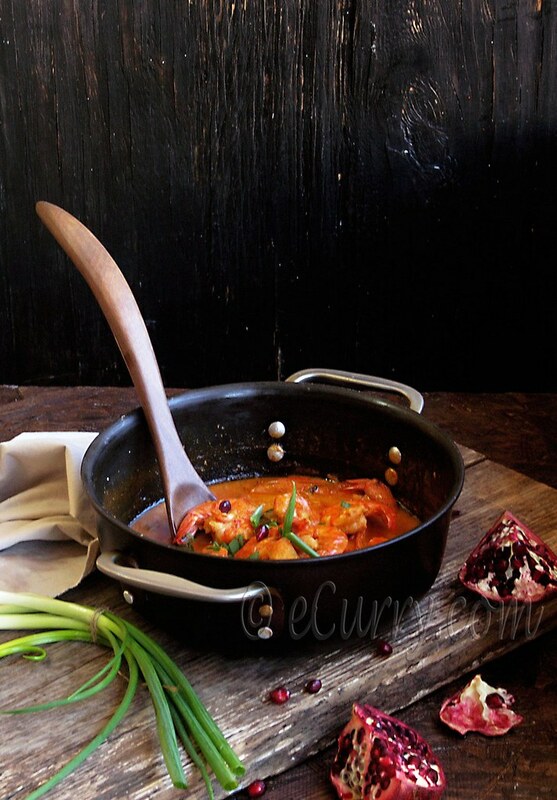 A curry with a sweet aroma and the naturally orange hue calls my name. Chingri Maacher Malaikari is a classic. It is a well known and well loved recipe from my home state – West Bengal. Almost every special occasion (and not so special ones too) call for these jumbo shrimps and the air in the home dances with the fragrance of them getting cooked. I remember how I would eagerly wait for the meal time to lay by hands on these huge shrimps, all with head and tail on and the very aromatic yellow orange sauce seeping through the hot steaming rice. The authentic recipe uses fresh coconut along with freshly squeezed coconut milk. My ma had to go though a very time consuming process of grating fresh coconut and making coconut milk at home. There were no pre-packaged cans; and even if there were, I double she would use it. 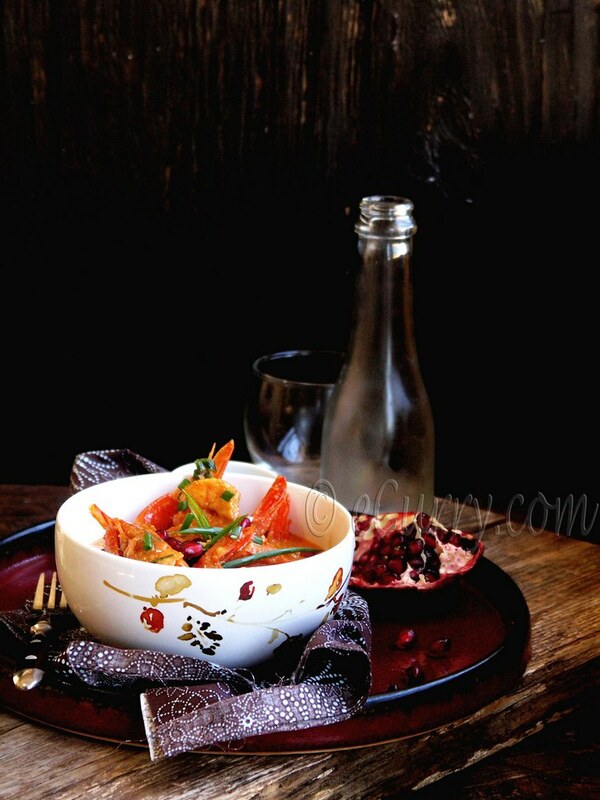 The head of the shrimp does add a very different taste, texture and to some extent the orange hue to this quintessential dish. The sight of these colossal shrimps enticed me as I walked by them; I turned around and came back to the counter and bought myself a few pounds. They reminded me of the times when my dad visited the Sundarbans (the largest mangrove forests in the world), for his work, he would get these really enormous shrimps, almost sized like lobsters. And when he got them, all I could think of was my next meal. I “met” Tika in Flickr. Along with the cooking, the love for food photography leads most food bloggers to Flickr; the spot to mingle with like minded people, to learn and discuss food photography. 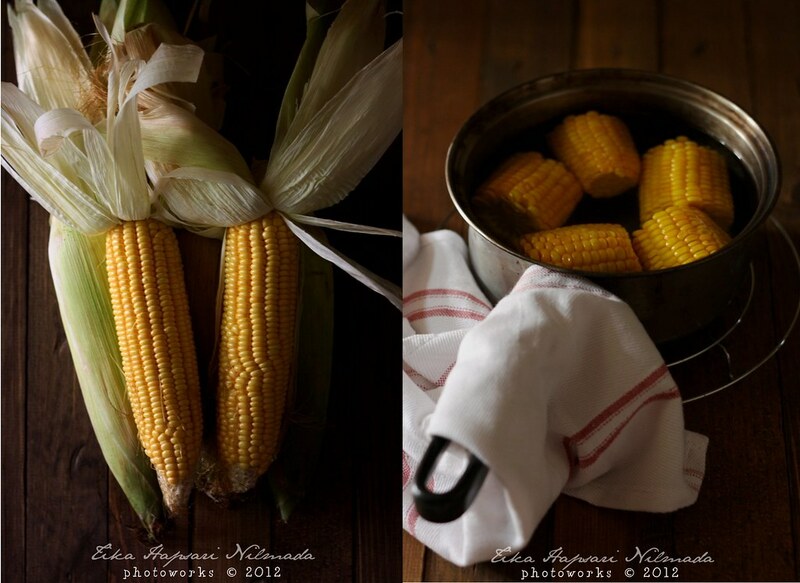 Her beautiful stream of photographs, led me to her blog. Besides the traditional recipes, she also writes about food photography which are like treasure posts for those who want to learn. Light, angles, tricks, you can find it all there. I am so happy to do this post for this warm wonderful lady. 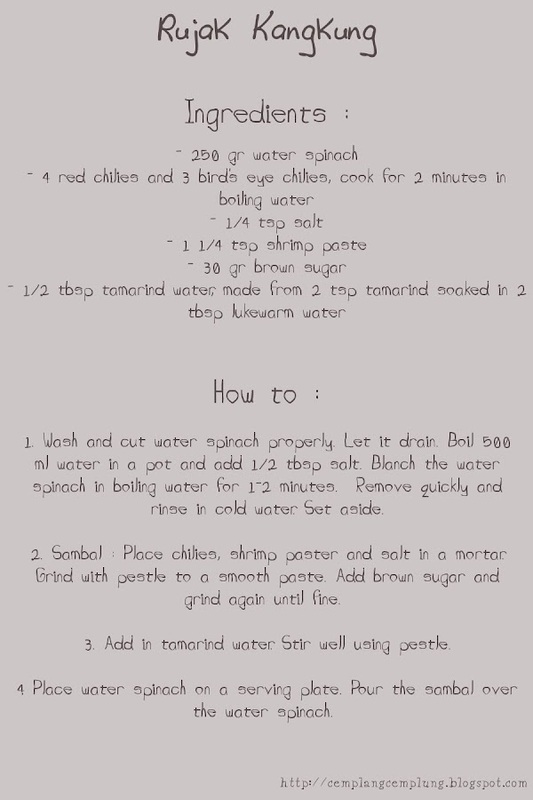 This time, I did play around with the authentic recipe a tiny bit. I have the luxury of using ready to use cans of coconut milk. I have not used any fresh coconut. The original dish is spicy with a hint of sweet, and I though of using the fresh pomegranates that the season offers to further enhance this “little” sweet. The crunch and the juicy fresh pomegranates do add another dimension to it. I also marinated the shrimp for a little while in pomegranate molasses. It might sound like a very unlikely combination, but the little tart and the depth of flavor of the molasses accessorized the dish without having it lose the original essence. And the scallions were crisp, fresh and very non traditional, but lovely too. 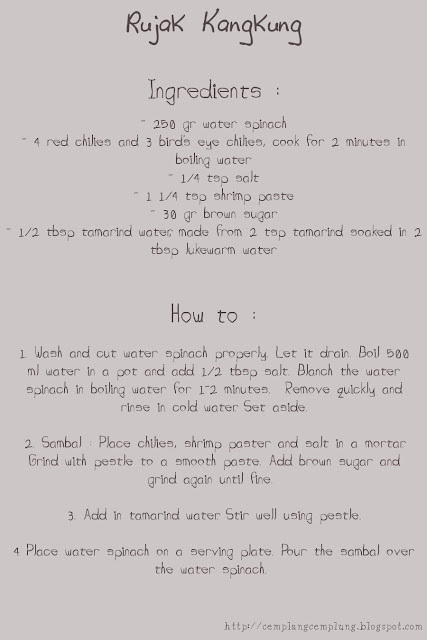 Here is the recipe for my friend! I am really happy to do it for you. 1. Clean, de-vein and wash the shrimps. Leave the tail on and if you wish leave the shell and the head on. Pat them dry. Place the shrimp in a bowl. Add some salt, 1/2 teaspoon turmeric, and pomegranate molasses to the shrimp. 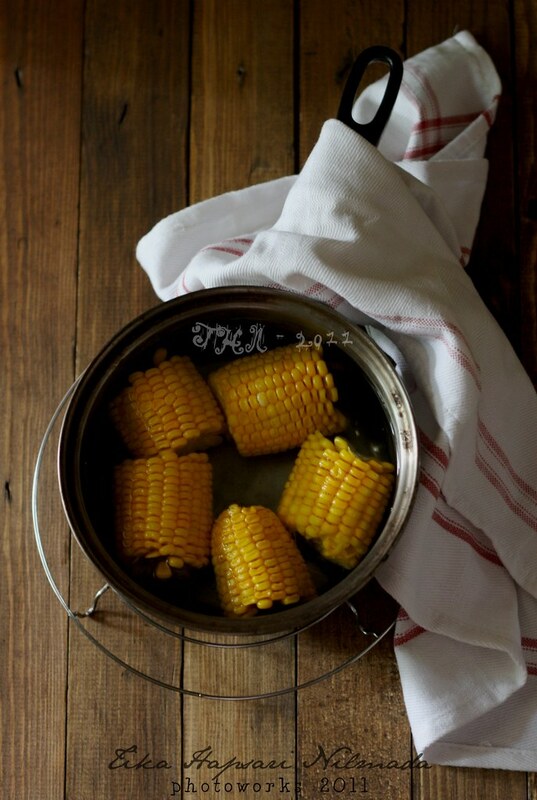 Toss to coat and set aside to sit for about 15 – 30 minutes. 2. Transfer the marinated shrimp to a pan and cook with a couple of tablespoon of water added to it, for a couple of minutes, or just until the shrimp changes color and start to curl up. Remove from heat. 3. Combine coconut milk, 1/2 cup water, cinnamon, salt, 1/2 teaspoon turmeric, sugar and red chili powder; set aside. 4. In another pan, heat oil. Add the cracked cardamom pods, cinnamon stick and the cumin seeds. When they start to sizzle and pop, add the slit green chili pepper and the grated ginger. Stir it for about a minute at medium heat. Do not overcook or brown the ginger. Just when the spices starts to get fragrant, add the spiced coconut milk, stir everything in and simmer from about 5-8 minutes in medium heat. The sauce will come to a boil. Add the partially cooked shrimp and any leftover liquid with it in to the pan. Partially cover the pan and cook for about 3-5 minutes. 5. Switch off the heat and add the chopped scallions into the pan and stir them in. Adjust salt. 6. Just before serving add the pomegranate arils to it and stir them in (add the fresh pomegranate only to the part you would be serving as the arils wilt and change color in the sauce and does not taste as good if stored and saved for later). 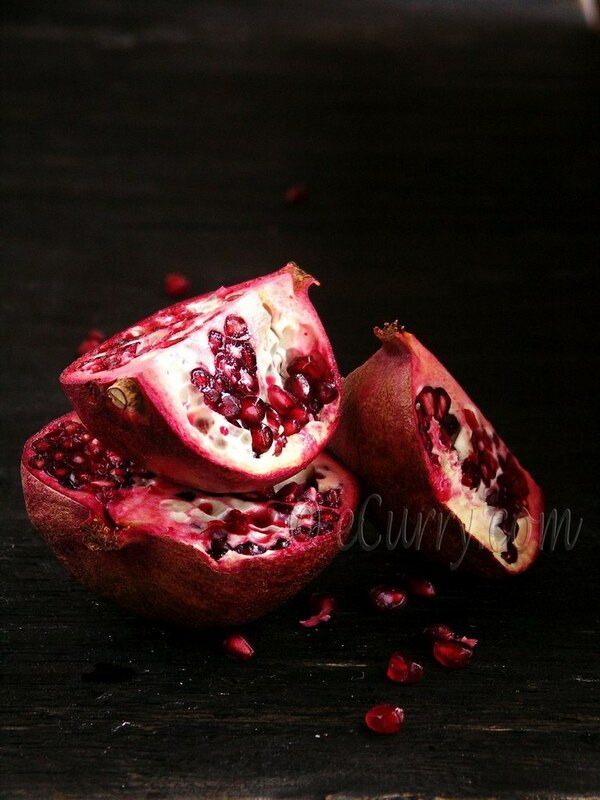 I would want to suggest that you serve the pomegranate arils by the side and garnish it as you eat. 7. Serve over hot white rice or with some nice crusty bread. Sadly to say, my plan turned 180 degrees, I made Rujak kangkung instead of Plecing kangkung. :) Why ? Because I didn't have any tomato as one of plecing kangkung ingredient. :D Rujak kangkung is almost the same with Plecing kangkung (except for some of the ingredients). The sambal (chili sauce) of Rujak kangkung doesn't use tomato and limo lime. Plecing kangkung or rujak kangkung, whatsoever, at least I didn't have to hold on my craving ! I'm not sure which part of Indonesia does this food come from. 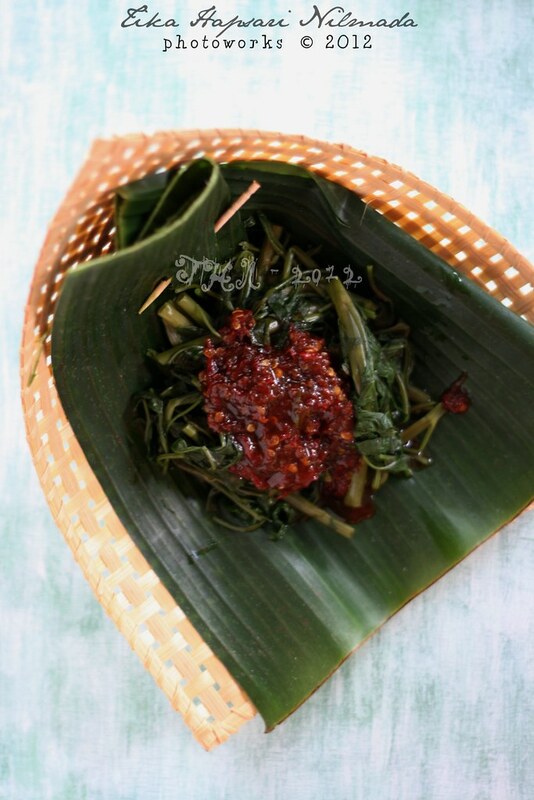 But knowing the blanched water spinach with sambal like this one, yup this is Indonesian food. 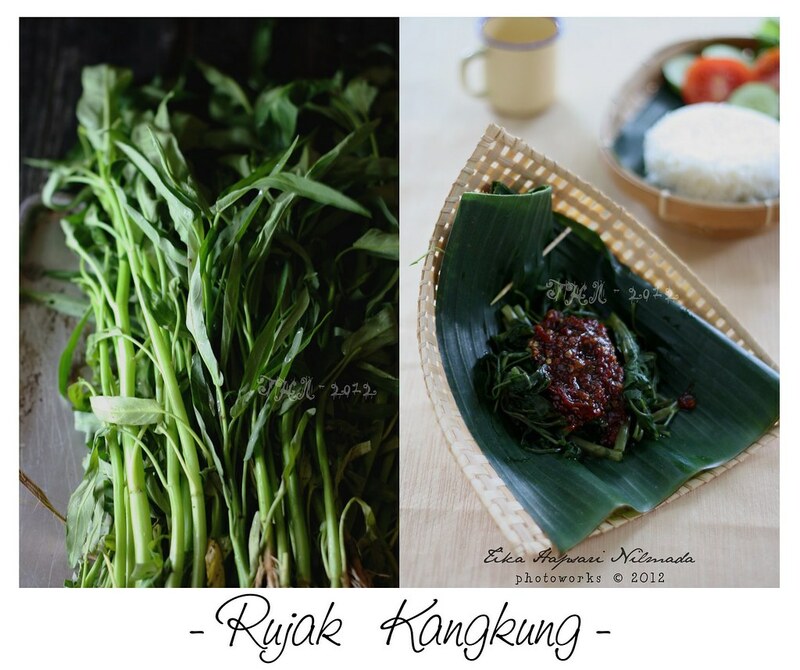 From what I read, some people in Kuningan, West Java, sell Rujak kangkung and they also claimed that it originally from Kuningan. :D One thing I should tell you, it worth to try. 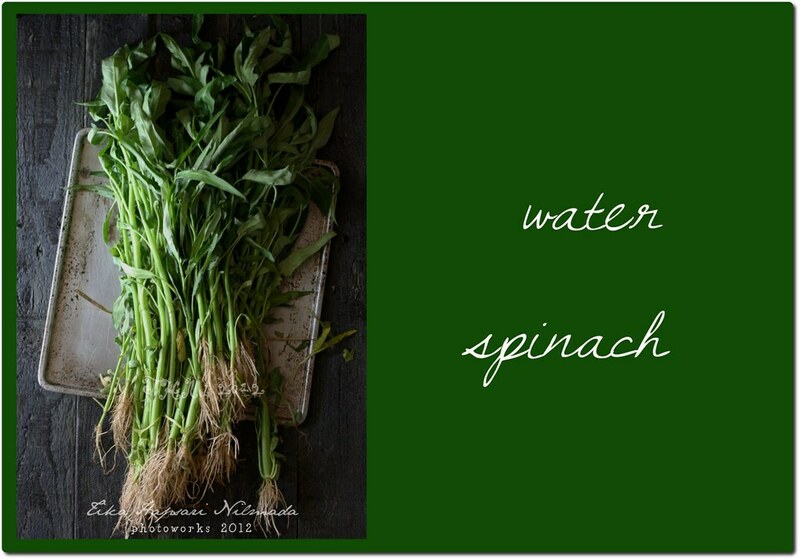 The water spinach tastes crunchy and the sambal really rich in flavors! Spicy, sweet and sour. Reminder, my 2nd blog anniversary giveaway event is still open until the end of the month. If you're interested to join in, read the details here. I'm waiting for your participation, the more the merrier. Once again, good luck everyone ! I want to share my happiness with you (again). 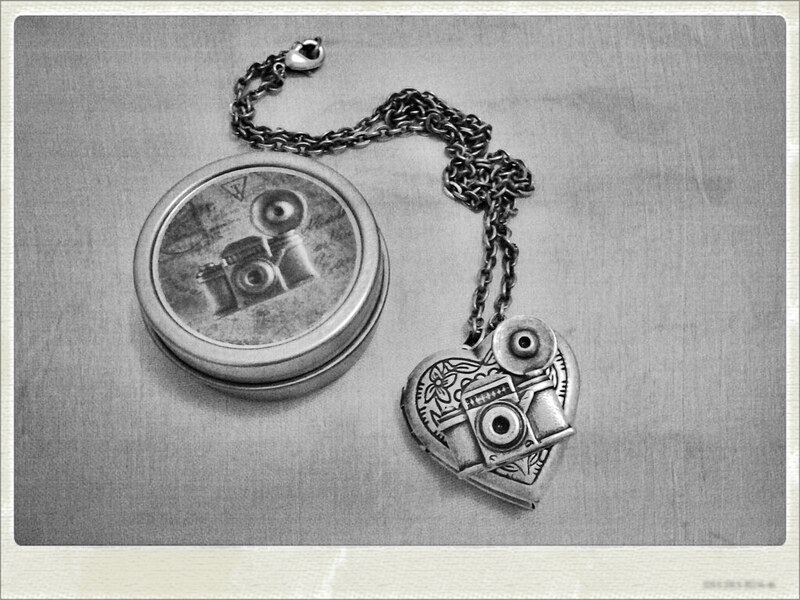 I already received the prize from Nela of Beloved Star, a beautiful Camera Locket Necklace. It has a camera and heart-shaped locket and also has dove color. Although I don't like wearing necklace, ring, earring or any other jeweleries, but I'll keep it in my jewelery box. It's one of a kind to remember that I won the first prize. 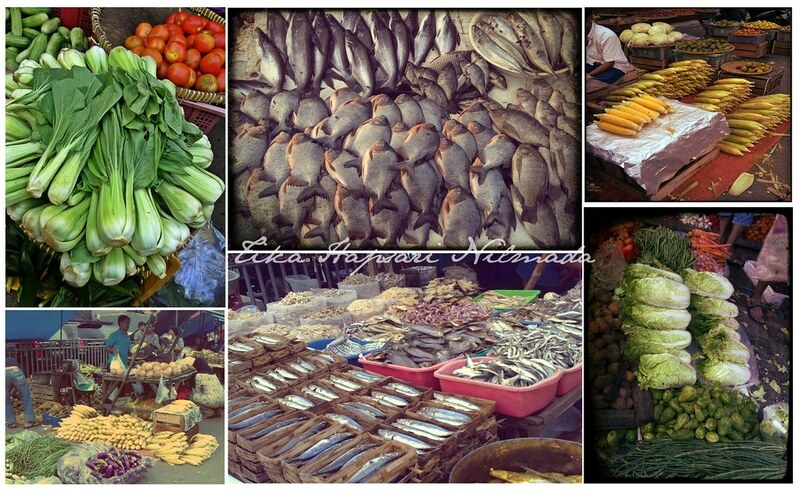 These are pictures I took from one of traditional market in Jakarta. Fresh fruits and vegetables are everywhere. Farmers sell their harvests on the market. Busy activities like this will continue until dawn the next day. Buyers come from around the market area even farther only to find the best products with good price. This is the place where I bought sweet corn for my afternoon snack. The seller sells corns with husk still on and corns that have been cleaned from the husk. You can bargain down the price of things you want here. Just ask the price, bargain, deal, pay and take it home. I believe, traditional market will be one of the place I miss if I live abroad. 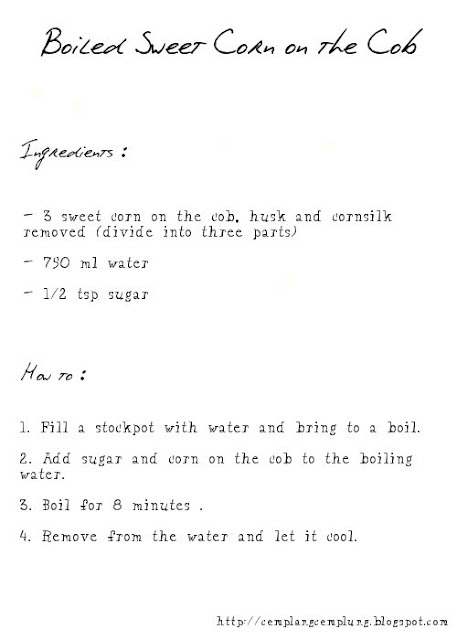 So, one day I simply enjoyed my afternoon tea time by serving boiled sweet corn on the cob for the whole family. 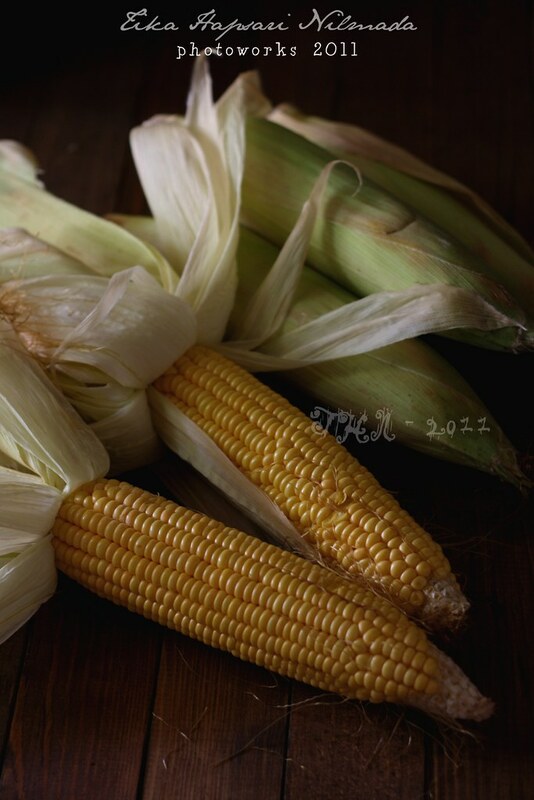 The rain poured down, the wind breezed up kissing my face, enjoying a cup of tea with warm boiled sweet corn. What a peaceful afternoon I had that day. What motivated you to start your blog ? For the last 2 years I've been keeping my works, passion and love through words and photos. From preparing all ingredients, cooking, food styling, photographing, editing and finally I write a post on my blog and share it with you. I enjoy every steps though. But I never say it was easy, writing a post is not easy for me. Now, this blog has become my second home. I keep it neat and clean. 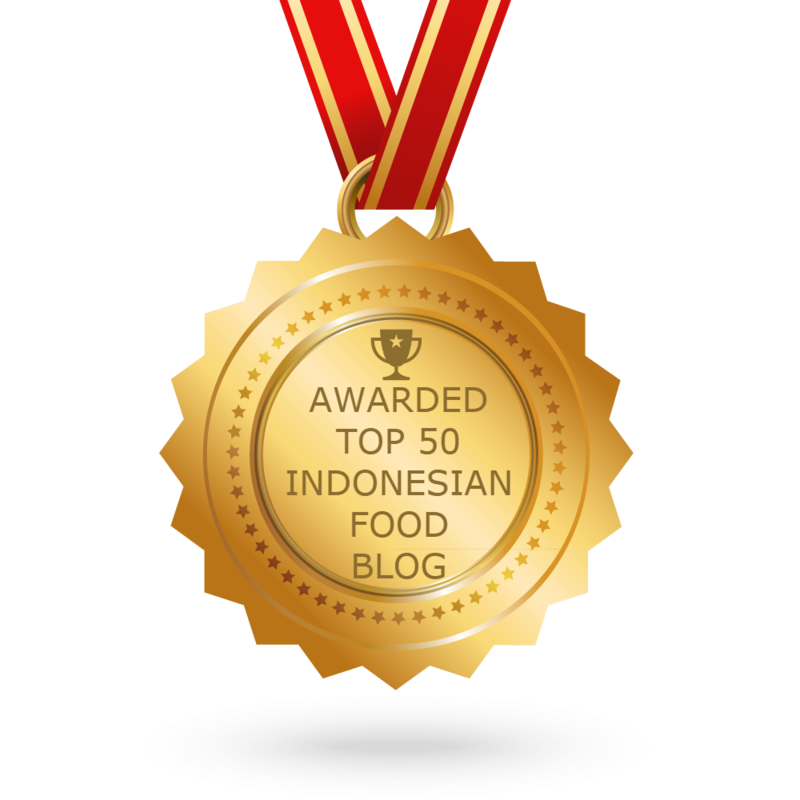 As I promised you on my post on December 2011, I'm celebrating my 2nd blog anniversary. 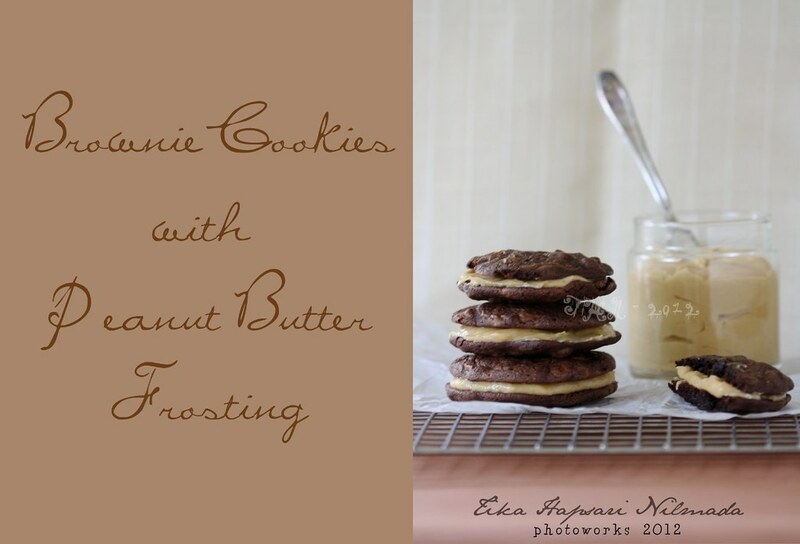 Before you go to the details, please enjoy Donna Hay's Brownie cookies with peanut butter frosting. I did some adjusting in the recipe (I reduced the sugar) and made it not too sweet for my tooth. :D I also stored the cookies in an airtight container in the fridge. It tastes much much better !! 2. 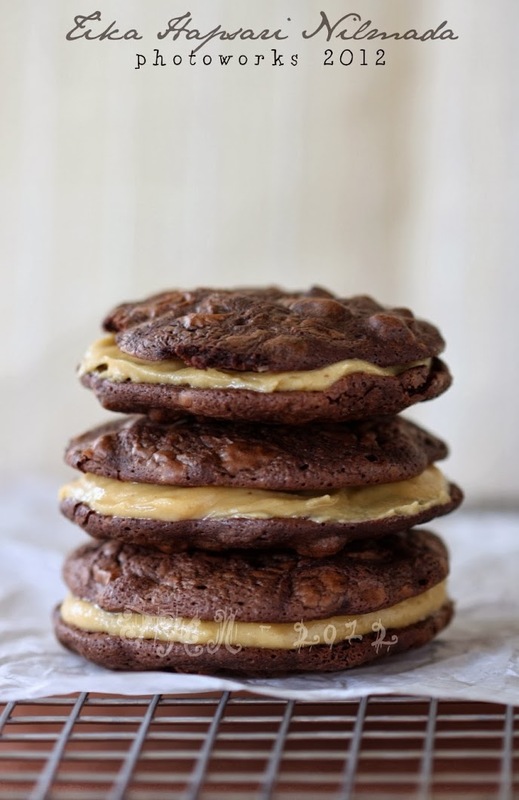 Cookies : Place the chocolate and the butter in a small saucepan over low heat and stir until melted and smooth. Set aside. 3. Place the eggs, sugar and vanilla in the bowl of an electric mixer and whisk for 15 minutes or until pale and creamy. Stir through the flour, baking powder and chocolate mixture and allow to stand for 30 minutes. 4. Spoon tablespoonfuls of the mixture at a time, onto baking trays lined with non-stick baking paper. Bake for 8-10 minutes. Allow to cool completely on trays. 5. 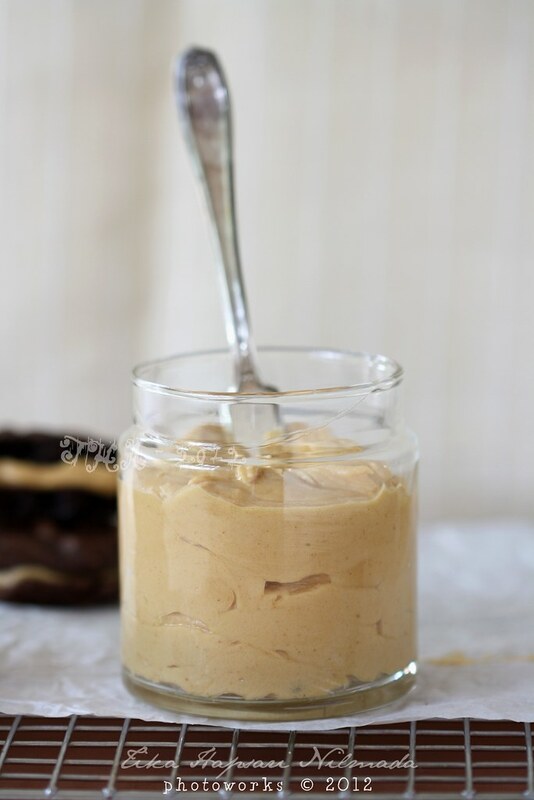 Peanut butter frosting : place the sugar, peanut butter, butter and vanilla in an electric mixer and beat for 6 minutes or until light and fluffy. 6. Add the cream and beat for a further 2 minutes. 7. 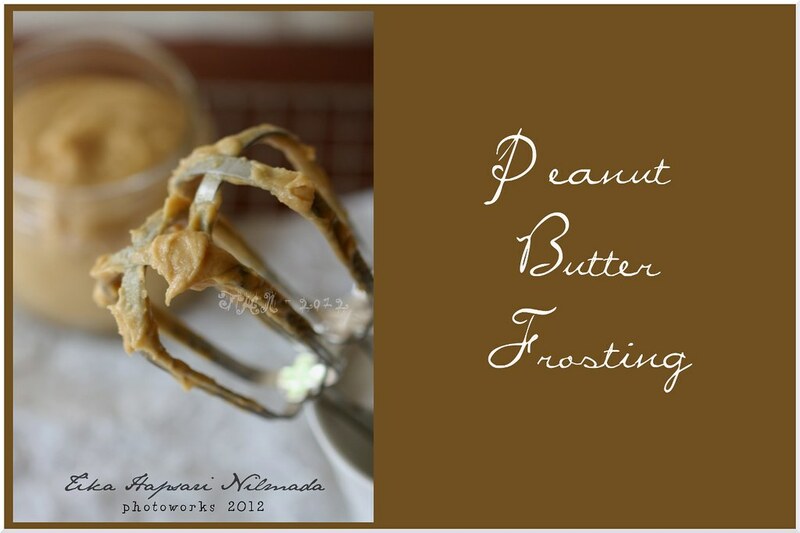 Spread half the cookies with the peanut butter frosting and sandwich with the remaining cookies. SECOND BLOG ANNIVERSARY GIVEAWAY **CLOSED !! To show my gratitude on my 2nd blog anniversary this year, I'm hosting a BLOG ANNIVERSARY GIVEAWAY ! A set of porcelain white bowl with a wooden tray as the prize. 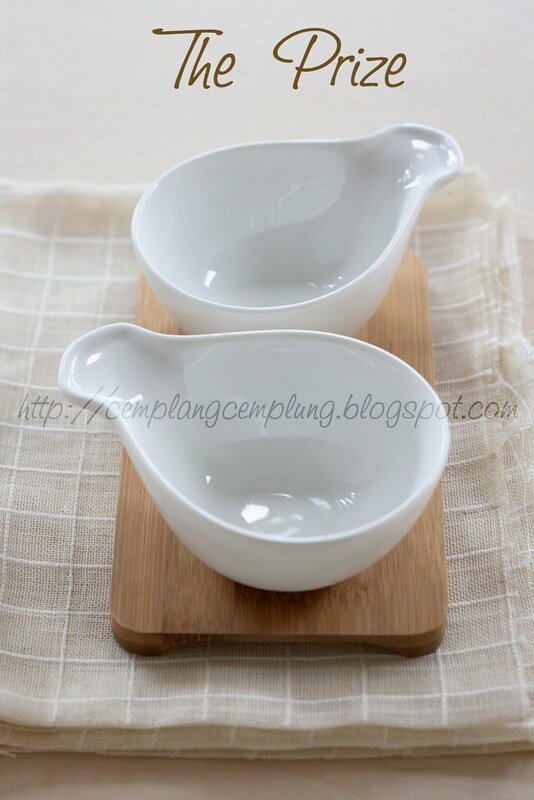 Looks perfect for your food photography props or you could use it daily on your dining table. 1. Write about "The reason why you started blogging" on your post and mention about this event (and link back to this post). 2. Leave a comment in this post telling me you have done so, including the link of your post. (can be written in English or Bahasa Indonesia). 3. This giveaway will run until January 31, 2012 at 11:59 PM. I will announce the winner on February 2, 2012. 4. The winner will randomly be chosen.